There's a total of SIX reports on the Reporting page. Teams on the Unlimited Plan have full access to every report, but teams on the Free Forever Plan are limited to the Tasks completed report. Be sure you focus the tables on what matters. Set the Space(s), Project(s), or List(s) you're most interested in, and then choose the time period you'd like to monitor. You also have the power of the filters you're used to from List and Board View. Choose the period for the data displayed in the report. 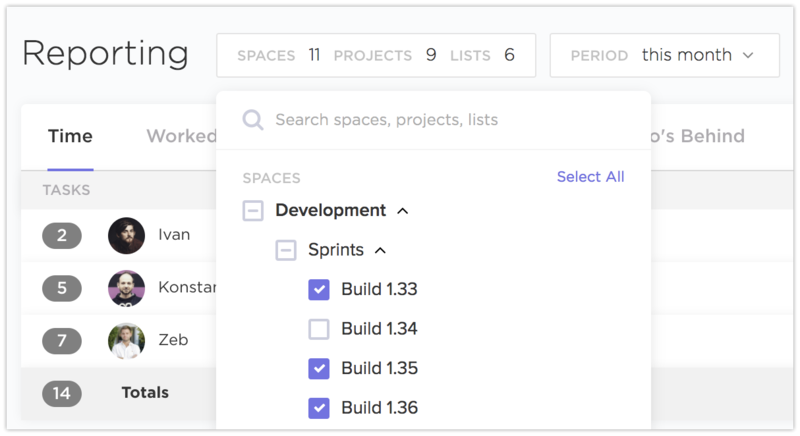 Quickly view time as a team resource for planning projects. The time remaining indicator calculates (time estimated) - (time logged) to determine whether or not your goals are on schedule. This report does not provide a time period filter. - Time estimated is not inherently related to exact dates. Therefore, adding a time period filter for this feature would render its comparison with the time tracked feature useless. This table also gives you the ability to export much more data. See a total how much time each person on your team has tracked. With cumulative time tracking logs for each team member, there’s accurate information on how time consuming a List of tasks has been. This includes time tracked manually and automatically, such as the ClickUp Chrome extension, Toggl and Harvest. This is the best place to dive in and take a look at the tasks each team member has been active in. "Activity" is essentially any action performed in a task. This report shows tasks completed by each team member. A task completed is counted towards the team member if that user(s) is assigned to the task at the time it was closed. Lead Time: This shows the time it took for the task to be completed since the task was created. Because everyone on an Unlimited team has access to this tab, it's an excellent way to hold your team accountable for clearing their notifications and completing overdue tasks. Note that total uncleared notifications and total overdue tasks are representative of a current state so there is no need or option to filter based on time period. These let you work with sums, averages, and ranges of all values in the column.